Mash potatoes have to be the ultimate in comfort food. Do you like them totally smooth, a few lumps, lots of lumps, dripping with butter melting off the top or with gravy in a pool on top? Honestly I could eat them any way they are served. 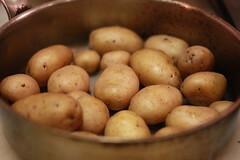 I love Yukon gold potatoes best for mash potatoes. 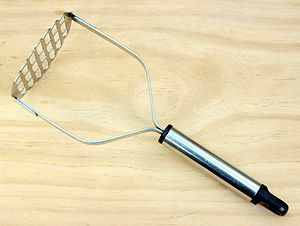 My preferred way to mash is with an old fashioned potato masher. You have total control of how smooth or lumpy the potatoes become. If I want really smooth and creamy potatoes I mash them until the lumps are out. If I want some lumps I mix them less. I love just a few lumps with butter or gravy. To put my mash potatoes over the top I add either 2 teaspoons of cream cheese or 1/2 cup of sour cream. To give them a little bite I add green onion or fresh chives. Boil 3 pounds of peeled and quartered Yukon gold potatoes, Drain. Heat 2/3 cup of milk and add at least 6 tablespoons of butter and more butter to the top after there mixed. Lots of fresh cracked pepper and kosher salt. I used sour cream and green onion for my potatoes. Boil the potatoes. Add a good splash of salt. Gather your ingredients for mashing the potatoes. Drain fork tender potatoes. Add the butter, salt and pepper. Mash to desired smoothness before adding any milk. Add the sour cream, green onion. Mash to combine. Add the milk and mash to combine. I just made some potato salad. I haven’t posted it yet but I also love mashed potatoes. We had some during the Thanksgiving weekend with lots of turkey. I love that old fashioned potato masher, too. It’s great to use. This sounds very delicious! thanks for sharing! How nice of you. I sent my daughter and sister off with left over turkey. My daughter’s the one who made it. It tasted really nice. Enjoy your Sunday! I do like garlic in my mash too:) I only make mash potatoes in the fall and winter. I love to relax with a big bowl of them.